Choosing self-service business intelligence (BI) software is only the first step in implementing an analytics plan. Encouraging self-service BI adoption is both a technical and a human resource effort. 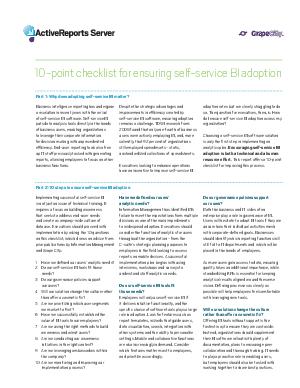 This white paper offers a 10-point checklist for improving this process, and discusses in detail, questions such as these in an easy-to-read format. Have we defined our users’ analytic needs? Do our self-service BI tools fit those needs? Do our governance policies support our users?